My mom did a great job saving a lot of our toys and especially the Barbie Doll stuff. I let my girls play with them which may not be the smartest thing to do but they are pretty nice to their toys. I pulled these chairs out of the bin and thought they were so cute. We made them or someone made them for us but I couldn’t believe they were still together. One day I saw them in the doll house broken apart. Apparently a tornado came through and broke them up (or so that’s the story). 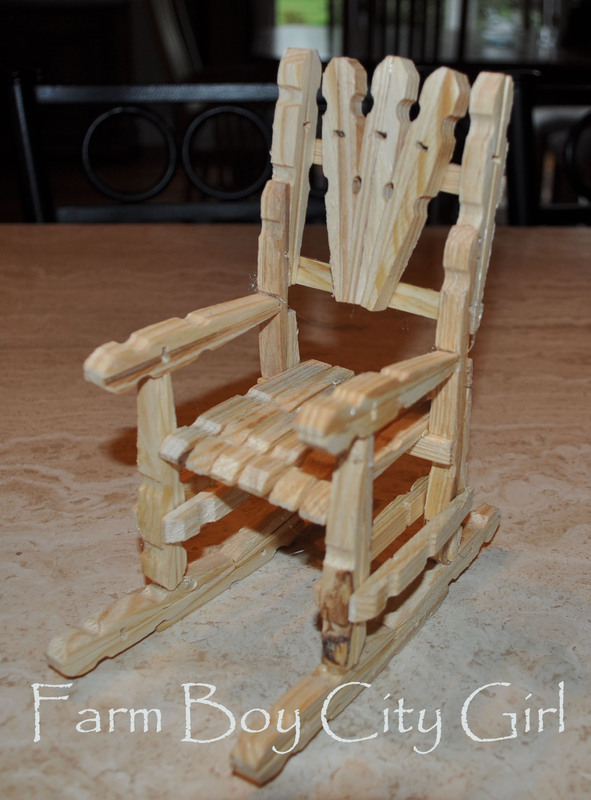 No big deal – I can hot glue them together so why not make another one and maybe even a rocker? 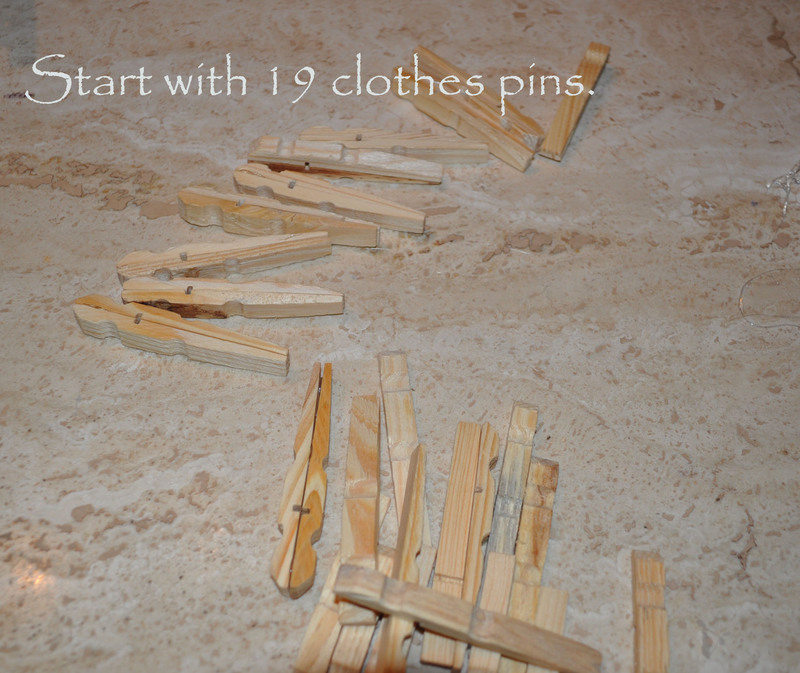 For the chair you need 19 clothes pins taken apart. If you want to do a rocker five more pins are needed. Next start assembling the parts. I started with the back. 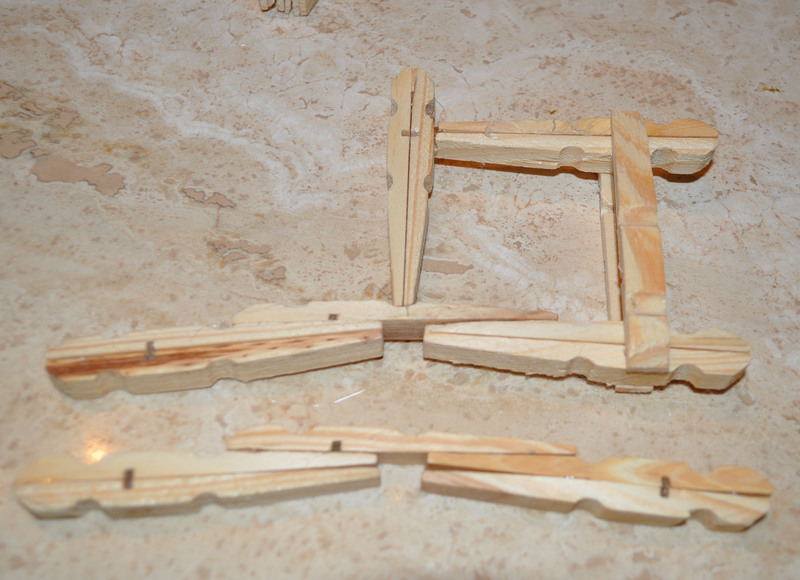 Hot glue the three pieces together separately and then glue them all together. 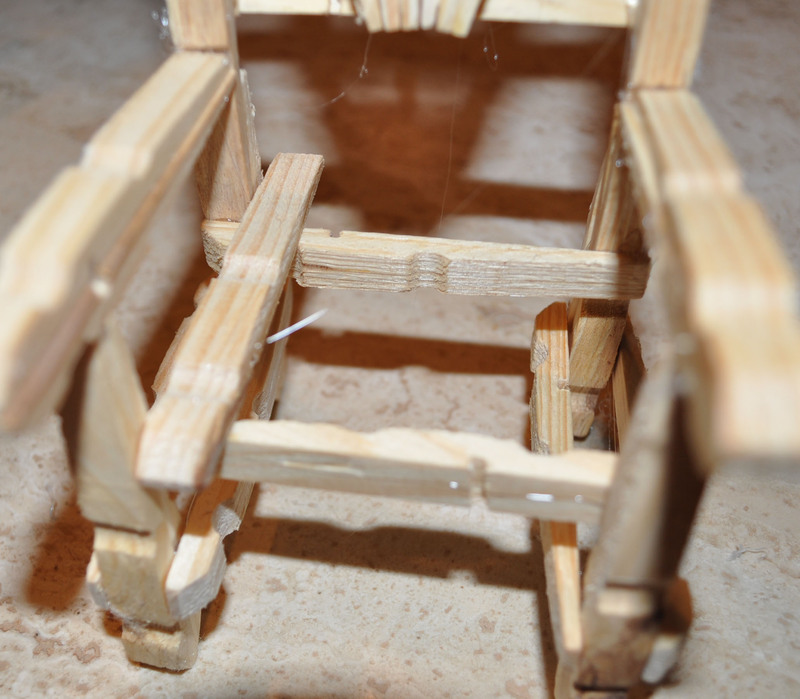 Now assemble one side of the chair. Hot glue the pieces together. This is how it should look. The picture is easier to follow then trying to explain it. 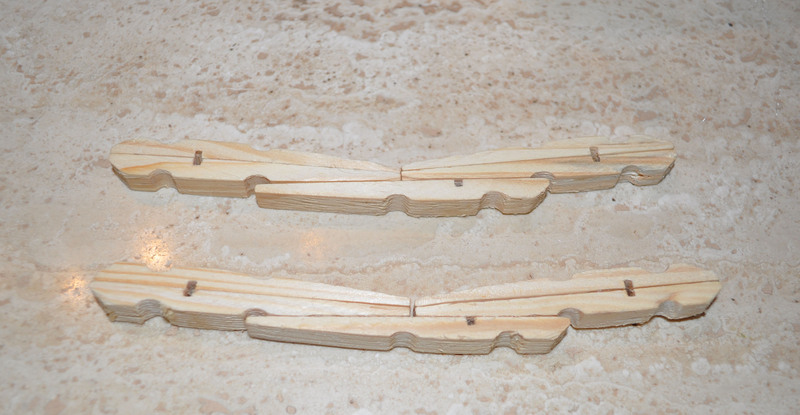 Turn it over and place the other brace alternating the large end of the pin. 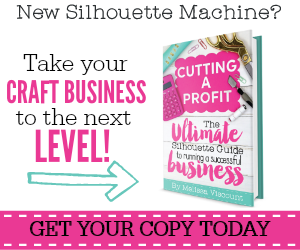 Repeat the process for the other side of the chair. 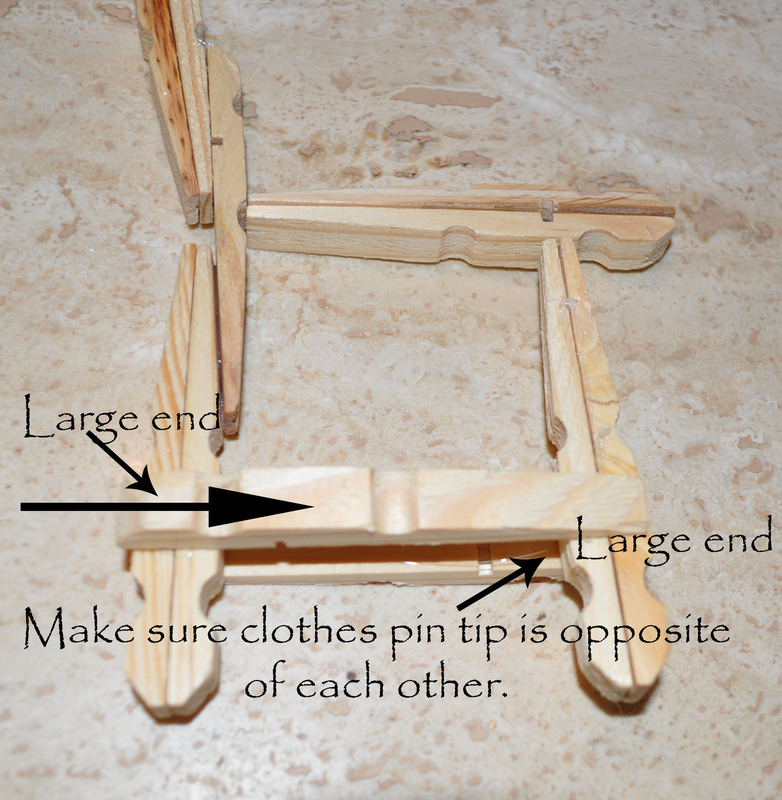 Make sure you look at the first side so you glue the pieces at the same spot. 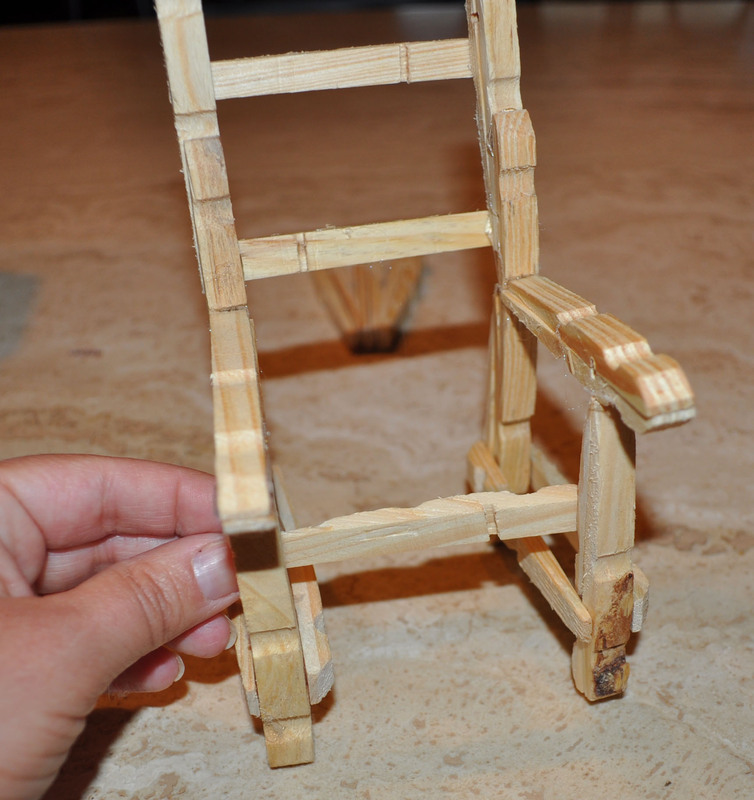 You don’t want a crooked chair…or at least I don’t think you do. Now it’s time to do the back. 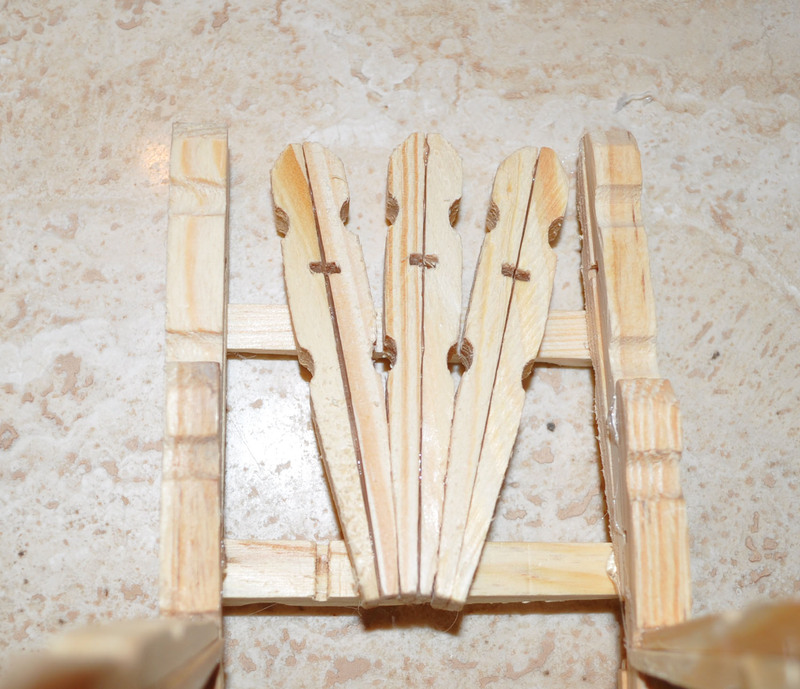 Put the two sides of the chair so they are parallel. 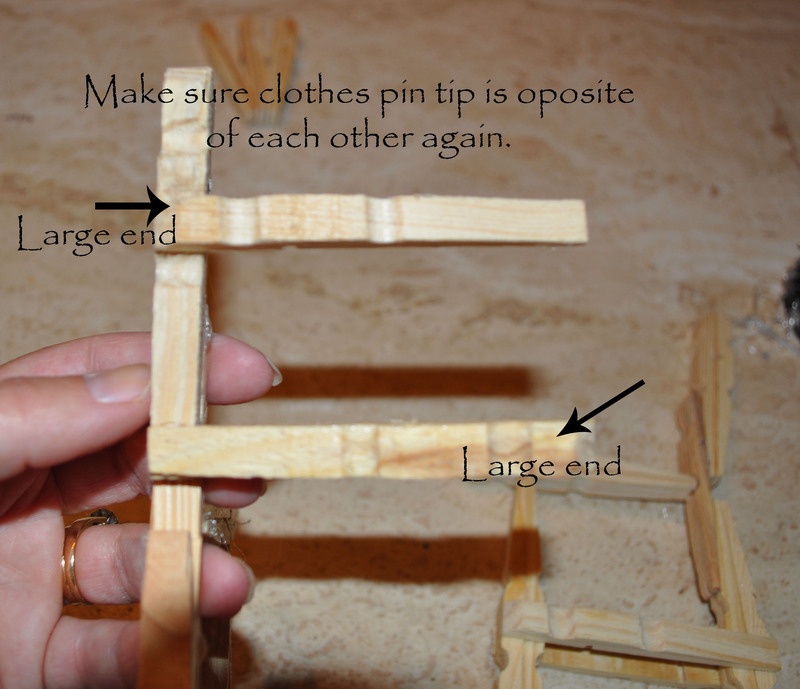 Take one half of the pin and glue the large end one way and then the opposite for the one below it. 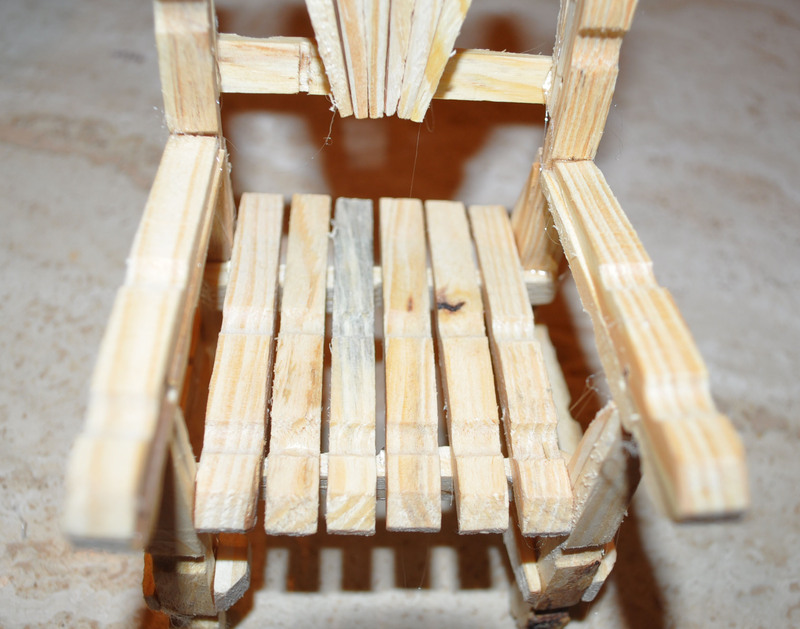 It’s easier to start with one side of the chair and then glue the second part after. Now its time for the seat. With the back on it sits well on its own. 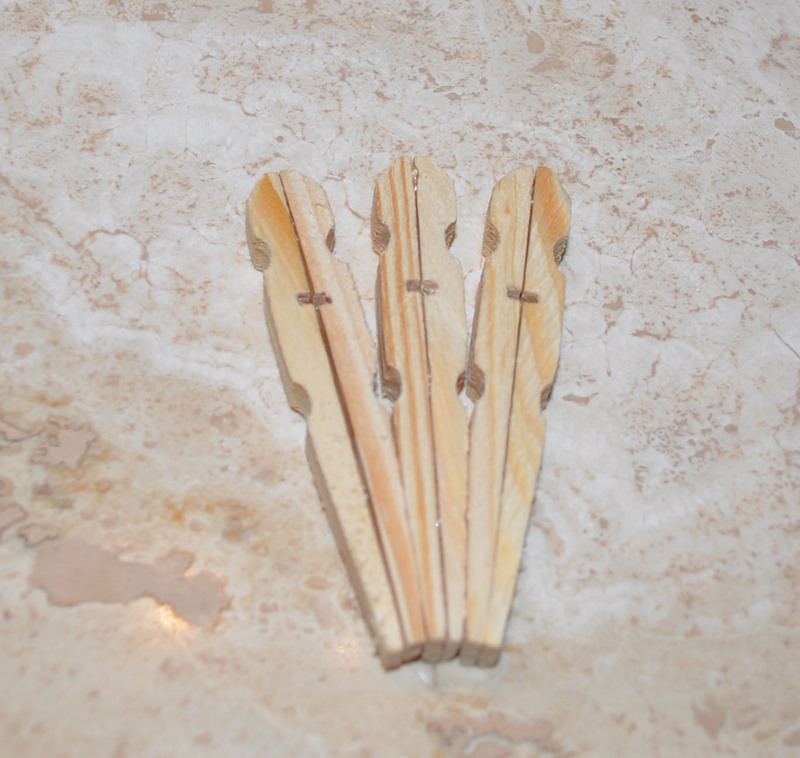 Do the same thing with the clothes pin by putting one large end on one side and alternate for the back of the seat. Three pins make up the seat. I like to lay it out first before gluing. 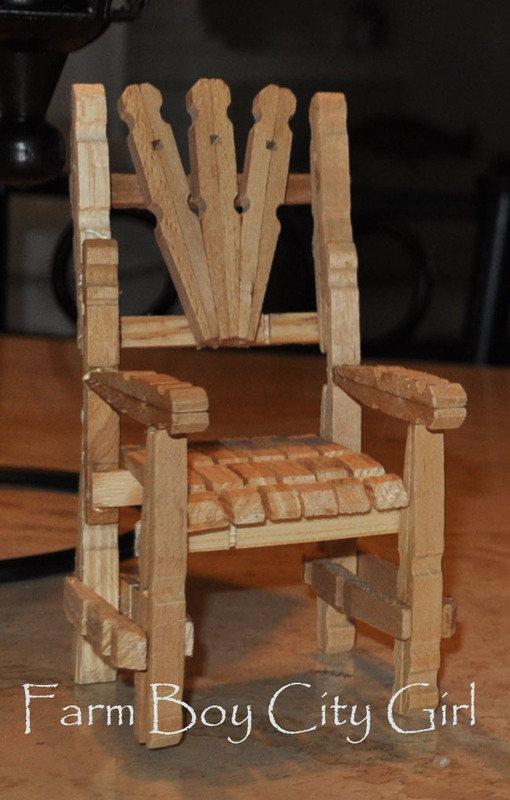 The back detail is the last part of the chair. 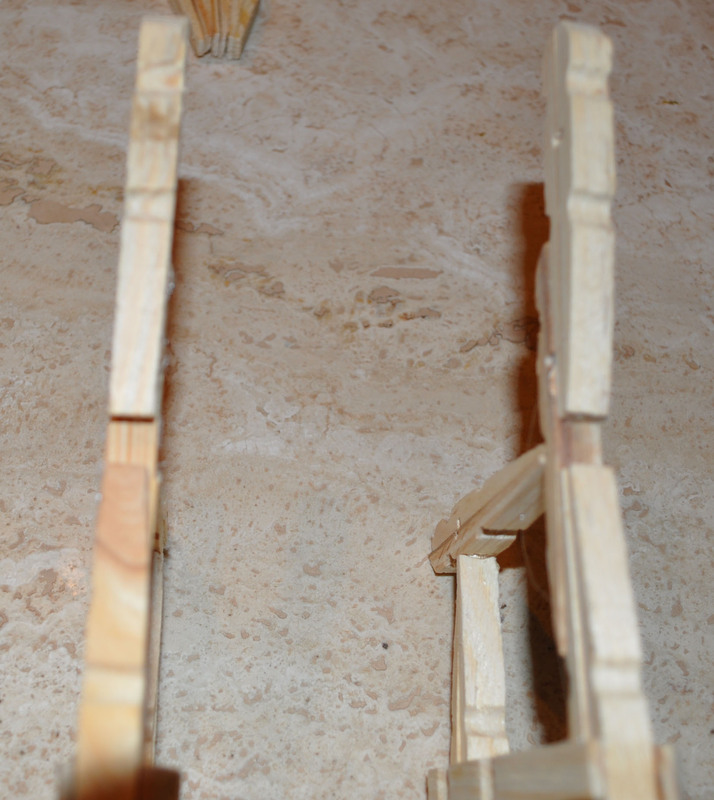 This was already glued together so you just need to glue it to the back. There you have it! All done. 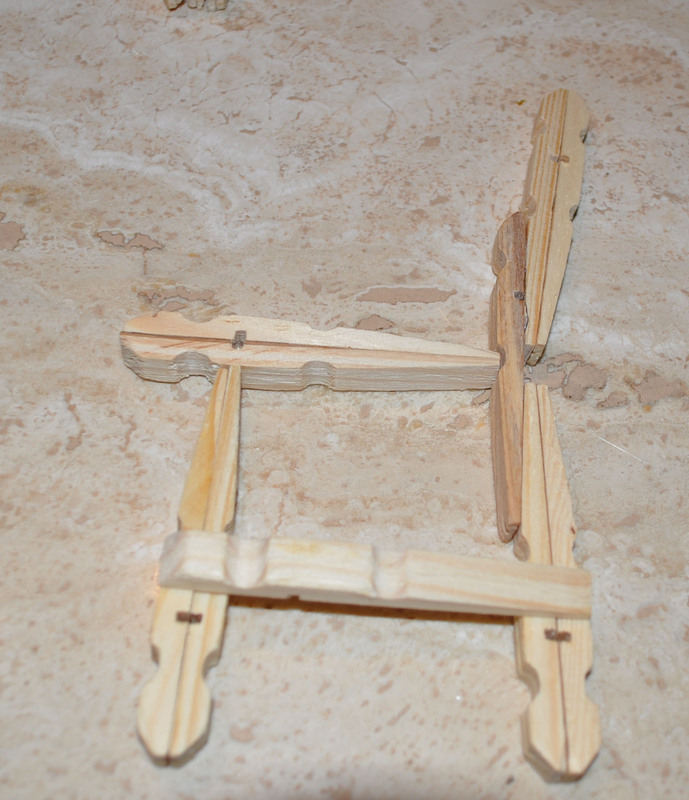 To make the rocker – glue the pieces like this: Then glue your chair on. How cute is that!!! Hopefully this one will escape the tornado! 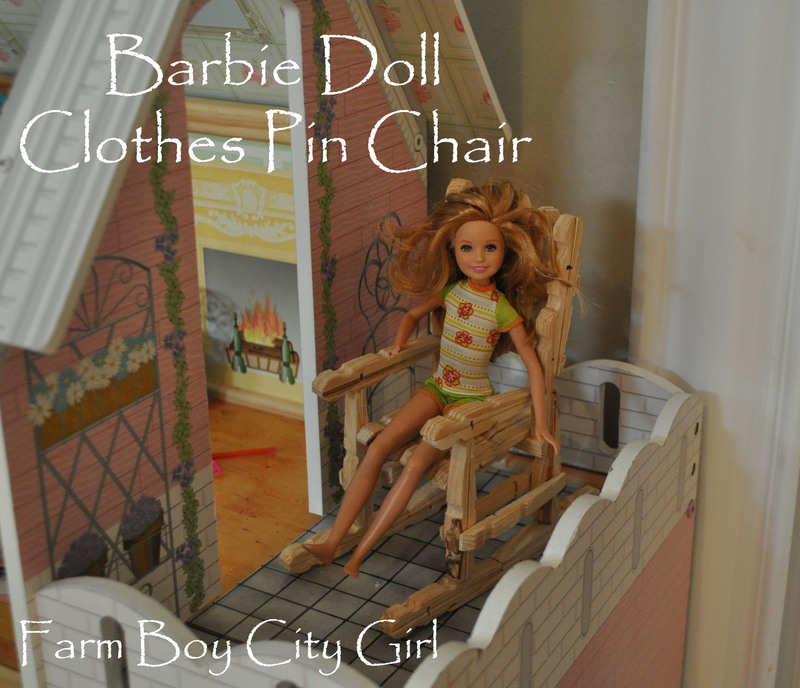 This entry was posted in Crafts, Kids Stuff and tagged Barbie, Barbie Doll, Barbie Doll Chair, Barbie Furniture, Chair, Clothes Pin Barbie Chair, Clothes Pin Furniture, clothes pin ideas, DIY Barbie Furniture, Doll Furniture, How to make a Barbie Chair, How to make Barbie Doll furniture, How to make your own Doll furniture, How to use clothes pins. Bookmark the permalink. Just did this for my girls, turned out just like the picture. Looks great and they love them.